Seven Days writers can't possibly read, much less review, all the books that arrive in a steady stream by post, email and, in one memorable case, a parliament of barred owls. 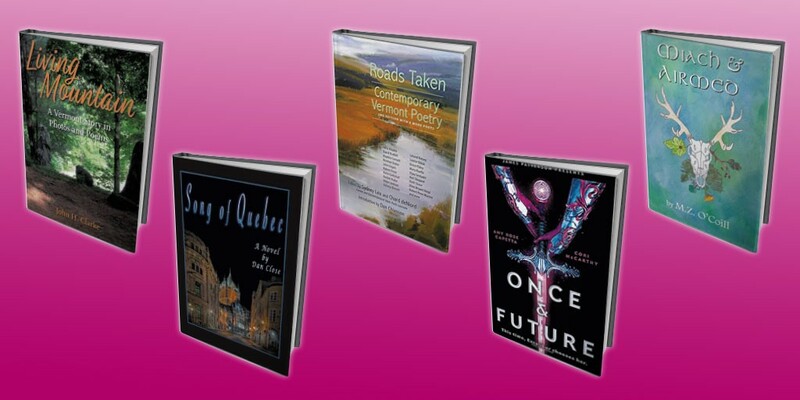 So this monthly feature is our way of introducing you to a handful of books by Vermont authors. To do that, we contextualize each book just a little and quote a single representative sentence from, yes, page 32. John H. Clarke, self-published, 100 pages. $25. Aimed toward the winter sun, / The first people placed their dead / Facing southwest toward failing light. Starksboro-based John Clarke is a former educator who has written or edited five books about student-designed learning. Living Mountain is not one of those books. Instead, it's a paean to life in his chosen home of the Green Mountains, presented through poetry and images of nature. Clarke's verses — all but one unrhymed — are unvarnished but evocative. The poems are corralled into five sections that loosely chronicle the seasons of a year. Since that year is in Vermont, weather and attendant tasks dominate the narrative: cutting trees, tapping trees, moving stones, planting gardens. More broadly, Clarke conveys the passage of years: the birth, growth, leaving and returning of children, and then grandchildren. Not until the final poem does he write of his time in Vietnam, of a brass bowl saved through decades and brought to a local high school, where students "sit to hear old soldiers with their grief." Dan Close, Taramac Press, 340 pages. $19.95. He was speaking to his friend, Henry Sparrow, who nominally belonged to the intelligence arm of the Mounted Police, but whom Le Claire had long suspected of being a CID operative out of London. South Burlington scribe Dan Close's latest novel begins with a bang. In the first chapter alone, readers encounter a shadowy figure, an explosion and a bloody assassination. Set in 1971 Québec City, this historical thriller follows Jack Kearney, a 25-year-old Mustang-driving, cigarette-smoking American, on a secret Canadian mission. When he encounters the enigmatic Genevieve St. Andre singing in the street, Kearney is struck by a dangerous attraction; this beautiful chanteuse is connected to the radical Front de libération du Québec. The author of previous works of fiction, ethnography, poetry and prose, Close peppers these pages with historical anecdotes and detailed descriptions of the urban landscape. He also mines the rich narrative of Québec's Quiet Revolution, a cultural shift characterized by secularization, education reform and support for separatism, to weave an exciting tale that could tempt adrenaline junkies and history buffs alike. Sydney Lea and Chard deNiord, editors, Green Writers Press, 370 pages. $24.95. Coming home with the last load I ride standing / on the wagon tongue, behind the tractor / in hot exhaust, lank with sweat, // my arms strung / awkwardly along the hayrack, cruciform. That's the opening of "Emergency Haying" by the late Hayden Carruth, who was declared honorary poet laureate of Vermont in 2000. Current poet laureate Chard DeNiord and former laureate Sydney Lea edited this rich, generous collection of the state's verse from Brattleboro's Green Writers Press; Burlington native Dan Chiasson contributed an introduction. Readers who follow Vermont poetry will dive into this volume as if it were a reunion with old friends — wildly diverse friends whom it's strange yet stimulating to encounter in close proximity. In the first 32 pages alone, we meet the tantalizingly elliptical verse of Paige Ackerson-Kiely (who now lives in New York State), the finely stitched reminiscences of Julia Alvarez, Partridge Boswell's gritty and exquisite evocation of the farming life, and verses by the late David Budbill, as simple and perfect as river-shaped stones. There are many more "roads" to take, leading to Robert Frost and Ruth Stone and Grace Paley and Major Jackson and newer voices such as Julia Shipley and Alison Prine. Exploring these highways and byways is more than worthwhile. Cori McCarthy and Amy Rose Capetta, Jimmy Patterson, 368 pages. $18.99. He didn't even seem worried that she was packing a sword. In a future where a single corporation rules all, Ari is running for her life in a spaceship called Error. Exploring the wasted wreck of Old Earth, she finds a sword stuck in an oak tree and yanks it out, summoning a magician who informs her she's destined to unite humanity. So begins the young-adult space opera Once & Future, a retelling of the King Arthur legend in which Arthur and Gweneviere are both girls, Merlin is a teen with a fondness for cute boys and pop songs, horses can be cyborgs, and knights can be gender-fluid. Montpelier coauthors Amy Rose Capetta and Cori McCarthy, who teach at the Vermont College of Fine Arts, nod at T.H. White's earlier Arthur modernization, The Once and Future King, as they infuse their book with thoroughly 21st-century social consciousness and humor. Trying to steal a catchphrase from a certain other famous wizard, Merlin says ruefully, "Well, that's Gandalf's line, but I had to try it at least once." If there's nothing new under the sun, Once & Future is certainly a lively reinvention. M.Z. O'Coill, Moose Maple Press, 262 pages. $17.77. What wisdom had she learned from the forest and the medicine plants that could save her brother's friend? Starting with its title, this volume by Montpelier-based ecologist, herbalist and philosopher M.Z. O'Coill presents numerous pronunciation challenges. But in Miach & Airmed (mee-akh, ar-a-ved), based on an ancient Irish myth, unfamiliar spellings are not the only hurdles. To apprise readers, O'Coill provides a glossary and pronunciation guide, several appendices, and ample footnotes. The storytelling, by contrast, is more futurist fantasy than textbook (though Appendix B presents an alarming political timeline for the next 75 years). O'Coill's tale begins in 2093 in Dawn Land — as Vermont was renamed in 2060. The story seems to have turned back on its origins, with residents living close to the land in cooperative communities. The titular characters are foster-siblings in a sort of rural-urban exchange program, destined to become great healers. O'Coill reimagines Miach & Airmed for a time after climate change has drastically altered how people live — an "era of healing the wounds that capitalism has left behind."